Will my horse ever be turned out with other horses? No. Unless requested by the owner – we prefer to keep the horses separate from other horses while turned out. If a group of mares and foals are purchased, we have no problem keeping them together in our tree-filled pasture, pending the owner’s agreement. Will my horse be locked in a stall all day and night? Absolutely not – we have many options of housing for your horse. EQUIFLIGHT has stalls with turnouts, paddocks, and large pastures to accommodate your horse. Does my horse undergo tests whilst in pre-export isolation? For most shipments there will be tests performed during PEI. Arrangements for these will be coordinated by EQUIFLIGHT. Does my horse need to be insured during the isolation period and flight? Insurance is not required, but highly recommended. EQUIFLIGHT can arrange insurance if needed. Please contact us for more details. Is a Vet on call whilst my horse is in quarantine? EQUFLIGHT has several veterinarians on-call and are surrounded by the best animal hospitals in Texas. Can I visit the horse whilst in quarantine? To preserve the quarantine integrity, quarantine visits are generally restricted. 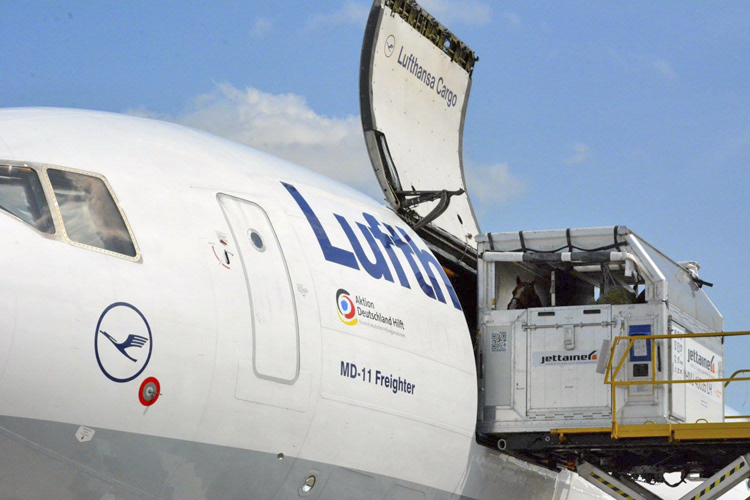 I understand the horses travel in stalls on the aircraft – how are they loaded onto the plane? When are duties/taxes (GST/VAT) at port of arrival payable? All GST/VAT and or Duties/Taxes are payable prior to commencement of the shipment. Will my horse experience jet-lag upon arrival? Yes- most horses will be very tired after flying. Like people, after a couple of days they will adjust to the new time zone. Do I need to allow a day of rest for my horse after flying? Depending how close your farm is to the arrival airport, it is always good to allow your horse to rest before trucking to your farm. EQUIFLIGHT can arrange the stabling at a local horse hotel if needed. In most cases the owners will collect the horse. You’ll get all information needed in order to know where to go and what documents to present to the airport authorities. If you choose not to pick up your horse, EQUIFLIGHT can arrange the trucking to your farm. What documents do EQUIFLIGHT need from me? EQUIFLIGHT will forward you an Export/Import booking form that lists what forms are needed. No. The only situation in which a horse will be tranquilized during transport is if the decision is made that the horse has become a danger to itself or to other horses or to people. If your horse is ever tranquilized during transport, you will be notified immediately. How is my horse taken care of during the flight? EQUIFLIGHT will send hay with the horses for the flight. All horses travelling with EQUIFLIGHT are supervised by an airline animal air attendant and an additional number of grooms provided by EQUIFLIGHT. The grooms travel with the horses to ensure that they have hay and water and are comfortable through the entire flight. Can I ship additional equipment with my horse? If there is equipment you would like transported with the horse, EQUIFLIGHT must be notified so that we can ensure that it is listed on the airway bill and accounted for. Basic items such as, halters, shipping boots, etc. can fly with your horse in the same container at no extra charge. If you need to ship larger items, such as a saddle, this will be shipped as cargo and a fee will be charged based on weight. Contact EQUIFLIGHT for more details regarding extra cargo. Should my horse wear leg wraps? Leg wear and wraps will be removed before the flight. You may send leg wear/wraps and a blanket to be shipped with your horse to be used upon arrival at the final destination. What equipment will EQUIFLIGHT provide for my horse’s shipment? EQUIFLIGHT will supply a new halter and lead when the horse arrives in our care. If necessary a blanket will be provided while in quarantine. If further equipment needs to fly with you horse, please let us know and we can arrange the extra cargo. Payment will be required 14 days prior to the flight date. EQUIFLIGHT works with a receiving agent at the port of entry and will connect you with this agent prior to arrival. Do I have to deliver my horse to the isolation facility or to the airport? EQUIFLIGHT can easily organize transport. However, if you wish to deliver your horse, you are welcome to do so. No. EQUIFLIGHT takes care of all import/export permit requirements at the port of arrival and departure. Why don’t you have a price list for transport posted on your website? There are too many variables in international horse transportion to list shipping prices. In the same way that the purchase price of an airline ticket can change daily, so can the cost of shipping a horse. EQUIFLIGHT will always make an effort to give you the most competitive rate possible. Contact us anytime and we will create a shipping quote based on your specific needs.